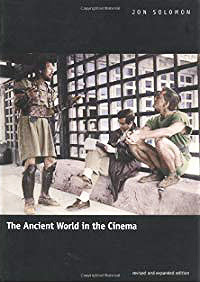 THE ANCIENT WORLD OF CINEMA by Jon Solomon. From the get go, this book is quite the disappointment. It only cost $8, which is cheap so I shouldn't complain much. There are good things about it, including historical timelines of events and the films next to those eras, ie 'Chronology of Greco-Roman History in Film' and 'Films of the Old Testament.' Good idea. Very simple and effective overview of historical events with the movies serving as context. I like this. It's only 5 pages long so it's not a big part of the book but it's cool nonetheless. The other good thing is that Italian PEPLUM titles ARE included in it, and quite often, which is a nice change from the usual Hollywood-centric books out there. This doesn't mean the book is not Hollywood-centric. It is. It's just that they actually discuss Italian productions along with the favoured Hollywood films. In the introductory chapter ('A Survey of the Genre'), the author even cites HERCULES (1958) has having been almost as popular as BEN-HUR (1959) or other epics of the time. This is a complete reversal of almost every book out there. It makes me go 'Yeah!' There is a problem with this though. As nice as it is to see a book on the PEPLUM genre actually acknowledging Italian films and their impact, the author's attitude towards them is as dismissive as nearly all other books out there. He calls HERCULES (1958) a film from the 'ketchupy flesh of Cinecitta'. You don't need to know anything else about the author's views of Italian productions with this dismissive description. The chapters are divided into different periods of history: Greek and Roman Mythology, The Old Testament, The New Testament and Tales of the Christ, etc.. This is not the first book to do this, and I personally thought of cataloguing films by the period they're supposed to take place (for the blog and possible PEPLUM book...). The problem with this (I've actually attempted this in the past), and the book suffers from this problem as well, is that many times historical events merge, making it difficult to perfectly categorize many films by storyline. This muddles up everything. For example, SIGN OF THE GLADIATOR (1959). It's a story about Queen Zenobia of Syria, or is it of Rome conquering Syria? If the author did follow his own logic, SIGN OF THE GLADIATOR should have been listed under 'Babylon, Egypt, Persia and the Ancient Orient' chapter, or maybe the 'Greco-Roman' chapter? See how things get confusing. But to make things even more confusing, the author actually puts this Anita Ekberg opus in the 'The Muscleman Epics' chapter even though there are no musclemen in the film! Is THE TEN COMMANDMENTS (1956) a Biblical film or is it a historical film set in Egypt? The author discusses it in great details in 'The Old Testament' chapter but barely mentions it in the 'Babylon, Egypt, Persia and the Ancient Orient' chapter. When you think about it, it doesn't make much sense. The entire book works (or doesn't work) this way. I personally don't like it. The titles should be in alphabetical order or listed in the year they were released. If you want to follow his reviews of movies set in Egypt, you have to go from one chapter to another since they're not all listed under one chapter. I'm aware that the chapters were written to discuss films of specific topics/eras but it doesn't work. Most of the chapters are devoted to reviews of the films in every category, and how they measure up in regards to history. I won't review the reviews but I don't agree with many of them. But that's fine. I don't have to agree with someone's review of a film to see how good the book is. The book has CALIGULA (1980), CLASH OF THE TITANS (1981), and GLADIATOR (2000) but not CONAN THE BARBARIAN (1982). Like so many books on the PEPLUM genre, more recent titles are mostly missing. The author lists the photos and illustrations at the start (in the Contents section), which is actually a good thing, but fails to add page numbers of these photos and illustrations, which defeats the whole purpose of making a list or an index of sorts. The first photo listed says Richard Egan from THE 300 SPARTANS (1962). 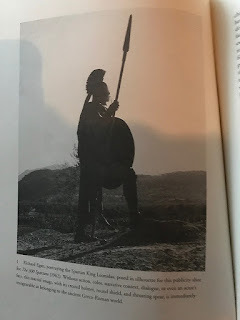 When you look at the photo on page 2 (see below), it's a figure of a Spartan warrior from the film, all in dark or shadows. We can't see if it's Richard Egan or not. It could be an extra. This doesn't make the book look professional at all. Also, the cover is terrible. It's a behind the scenes photo from SPARTACUS (1960) with Kirk Douglas, Stanley Kubric and Charles McGraw. It's a very confusing photo in that it makes the book look like some production history of SPARTACUS than a general book about the genre. Though it has some good ideas here and there, and it does acknowledge Italian titles, the overall quality is less than stellar. I give this book 5 out of 10. GUIDA AL CINEMA PEPLUM by Oscar Lapena Marchena. Since this book is in Italian (translated from a Spanish book), and my Italian is limited, I can't really review this book fully. I'll just mention a few things about it. Aside from its eye catching cover, this book's greatest feature is that it lists every title (Italian productions only) by the year they were released. Terrific idea. This way, one can have an excellent chronological overview of how the genre evolved. It also includes some films from the 1980s, including the X-rated adult stuff. But like so many PEPLUM books out there, it is incomplete. 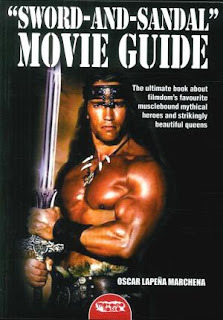 It also lists directors, and the author writes about directors who've made PEPLUM films. A definite plus. The index is only for titles. Not for actors or any other crew members. A definite problem for a voluminous book of nearly 400 pages. The photos and illustration are absolutely horrible though. Really embarrassing stuff. The author was kind enough to send a free copy. He warned me that this was printed before the age of the internet and it has mistakes in it. It's obvious the author enjoys these movies. Aside from my reviews here at the blog, some reviews in this are the most extensive reviews of PEPLUM films I've seen anywhere. For example, the review for THE WITCH'S CURSE (aka MACISTE IN HELL; 1962) goes over the storyline, the review and production details. This review was made before stunning copies of this Riccardo Freda film were released on DVDs, so his review is sorta hampered by this (all reviews actually). Since this was one of the first publications to go over the PEPLUM genre, this is not his fault. But I have to tell you that seeing MACISTE IN HELL in its original widescreen format blows away any copy of THE WITCH'S CURSE. It's almost like seeing two different films. So, it's almost impossible for anyone to give an adequate review of that film if seen as the cut, washed out US version. One thing he mentions about this film (or others) is that there's unnecessary padding to it. This is sorta common in PEPLUM films, with dance numbers, extended feats of strengths, etc, adding minutes to an otherwise pretty simple storyline. In the case of this film, I sorta disagree that it's padding. In MACISTE IN HELL, Maciste looks into a magical pool of water and we, in turn, see scenes from previous Maciste films. Though it might look like padding to most, for me, these scenes explain Maciste's 'time-travelling' abilities, and it explains why he's in Scotland, year 1550. Maciste became an angel of sorts who wasn't bound to time and space. The clips basically points to this aspect of our mysterious hero without having to explain anything, to us, the audience, or the few characters around. The best thing about this are the illustrative icons, which shows what the film includes (muscle man, monster, fights, etc). Creative way of a quick overview of a film's main aspects. All in all, I like the book, which is more magazine or zine than book. Maybe an update would be worth doing? as such, was one of the first books on this type of movie. It's a well researched and admirable project. The original has a beautiful color photo from Fall of the Roman Empire on the dusk jacket and the photo reproduction inside is good, for the most part. 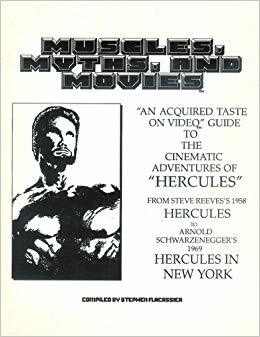 When it was first published, information of the Epic genre was not as readily available as it is today and this book was a godsend. I have no idea when the copy you have was re-printed or if it was in any way updated, but the original is both a scholarly and entertaining read. I agree that since this was one of the first books on the topic that it's good in that sense but for me the format just doesn't work. Haven't thought about that MMM book in years. It was published in a magazine format, which was an economical choice by the editor. You're right, its pre-Internet, which makes for a fun read. I loved the section where he talked about the trouble of finding the Peter Lupus movies. If memory serves right, he couldn't find a single one of them. Nope, I couldn't find any of Lupus' films at the time. Of course, got them now. I actually held back on printing the book looking for those and Reeves' "Goliath and the Barbarians". But they never showed up on TV, and I'd exhausted all the video rental stores in my area. Which were really my only options. Glad you still have positive thoughts about the book/zine.